Our 22 year old son, James, was in a car accident December 21, 2014. He suffered a devastating C6 spinal cord injury. 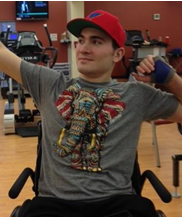 He is now quadriplegic, paralyzed from his chest down with limited use of his arms and hands. Prior to his accident, James took a year off college to work full time to save money for school. He planned to return to Southern Illinois University Carbondale in January. James loves to fish, hunt, and camp, is an Eagle Scout, played Rugby at SIUC, and wrestled at Alton High, Missouri Military Academy, and Lindenwood U.
James is now at QLI in Omaha, NE for intense rehabilitation. QLI teaches people with catastrophic injuries to live again, not just to exist. 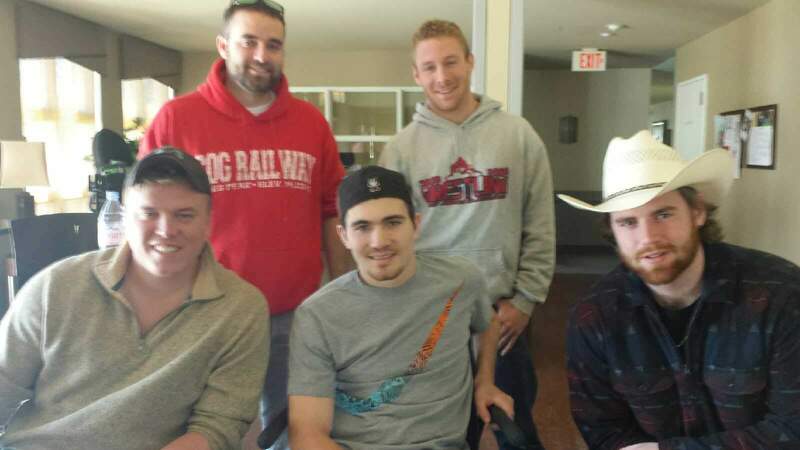 James has met his challenge with unbelievable strength, courage, and determination. He is an inspiration to us all. Once he leaves QLI, he will still have a long road ahead of him. The expenses of a spinal cord injury are astronomical. Even with insurance, there are many costs that are not covered. Some of these are home modifications, a handicap accessible vehicle, adaptive equipment, additional rehabilitative therapy, home health care, and much more. To help with the financial burden of James’s uninsured expenses, a fundraising campaign in his honor has been established with HelpHOPELive, a trusted nonprofit organization that has been providing community-based fundraising guidance to patients and their families for more than 30 years. All donations are tax-deductible, are held by HelpHOPELive in the North-Central Catastrophic Injury Fund, and are administered by HelpHOPELive for injury-related expenses only. Please consider a contribution. Click on the Donate Now button on this page to make a donation. James is injured, but his spirit, dreams, and potential are alive and well. Your thoughts, prayers, and kindness have meant more than words can express. We appreciate all you have done and continue to do, and we thank you for your generosity. Come out to Cash Bash site to obtain ticket. No longer accepting ON LINE Tickets. Late May James had a setback and was hospitalized in Omaha for a few days. From there, he was able to transfer to Frazier Rehab Institute in Louisville, KY. Once discharged from Frazier’s acute care facility, he was admitted to their out-patient program. Frazier Institute is a Spinal Cord Injury Model System and is the lead clinic for the Christopher & Dana Reeve NeuroRecovery Network (NRN). James has been in a Locomotor Training research program, & is receiving intense physical & occupational therapy. He has seen results with increased trunk stability & has been working hard to restore more function to his hands. James is taking on-line courses through Lewis & Clark Community College & plans to return to college full-time. He is facing considerable expenses with housing, still needs an accessible vehicle, & we continue to appeal our insurance company’s denial for a home Functional Electrical Stimulation Bike ($29,000), which his doctors are recommending, to restore use of his legs. James remains very hopeful. His goal is to someday walk again, & to keep in excellent physical condition so that he will be a candidate for “the cure,” which researchers say is just around the corner. We are so appreciative of the continued prayers, support, & monetary donations from the community, which will allow James to achieve his desire to remain a healthy productive member of society. We have an awesome committee chaired by Maureen McIntosh & Julie Dooley, which is planning a really fun fundraiser on Nov 21st. Please spread the word on this Cash Bash fundraiser far & wide. Wow, lots to share! James had a medical emergency on 5/27/15, which landed him in the hospital in Omaha. He is doing well now. Instead of discharging back to QLI in Omaha, he transferred to the Frazier Rehab Institute Hospital in Louisville, KY. Once discharged from Frazier acute care, he will attend Frazier’s out-patient therapy program. James will be staying in Louisville for the months he is in therapy. Our family will take turns staying with him and providing any assistance he may need. Frazier is the lead clinic for the Christopher and Dana Reeves NeuroRecovery Network (NRN). This a very BIG DEAL that he will be in therapy there! There is so much research, expertise, and cutting edge technology happening in the NRN. We have all of you to thank for your prayers, kind gestures, and generous monetary donations. It is no accident that James has this marvelous opportunity. We will need to pay for him to stay in an extended stay hotel for 4-5 months while in therapy. Also, we are still appealing to our insurance company to pay for the Standing Frame and FES Cycle (Functional Electrical Stimulation) that he will need at home. Just the FES Cycle alone is $29,000. Please continue to spread the word to your friends through emails and other social networking that if they would like to make a contribution, please do so. We appreciate all donations, large and small. Rick and I are heading to QLI in Omaha this afternoon. We will attend a Team Meeting and hear details on James’ progress. Will report back to you all soon. Many thanks to the Omaha Healing Touch Community including Mikki Allen CHTP, Deb Determan CHTP, and Kara Glynn HT Apprentice, who have been providing Healing Touch therapy to James since his arrival at QLI. HT has kept James balanced and positive throughout his recovery. For more info on Healing Touch, go to www.healingbeyondborders.org. Please see the photo albums below for new pics of James recovery. Shellan (Mom) will be adding new pics regularly. Easter weekend, James reported that he can wiggle his right 2nd and 3rd fingers about 1/2 and inch. That’s new- that’s progress! James has been training hard in therapy to transfer from his wheel chair into a car seat, his bed, or another chair. He accomplishes this with the use of a slide board. It takes lots of strength and focus to maintain trunk stability during the transfer to prevent falling. He is getting quite good at it, as long as he is transferring to the same level. Please pray that function will continue to return. If you don’t need another T-shirt a donation to www.helpHOPELive will be much appreciated. Stay strong, James! Keeping you in our thoughts & prayers. James, You are one of the strongest people who I know my buddy! Keep fighting and don't give up. You have inspired many people in cluding myself. Love ya! James, Keep up the good work! Never give up! Prayers for you always. Hi James, you sure get around! il,.Mo., Ne, and now Ky! Thinking of you, and in our prayers. Fly like Superman. I love all your cool T-shirts. Hi James, I'm sending donations on behalf of Trevor Kleinschnittger and Zach Hausman. They both wish you the best and hope to see you back home very soon. And, as always we do too. James- hang in there!!! We know you can do anything you put your mind to do.....remember selling your dad's beer to the neighborhood. Love and prayers to you and the family. Wishing all the Schwanks all the best. Your journey is in our thoughts. What's up man, this donation is being made on behalf of The Tour de Carbondale. We missed you this semester but know that you were there in spirit. Keep up the strong work! HI James, This donation is made on behalf of Mike and Mary Lawhon. They are friends of ours and members of The Alton Motor Boat Club. They are also the people I mentioned that have the young relative at QLI with a similar injury as yours. Like everyone else, they wish you the best and quickest recovery possible. Hi again, This donation is made on behalf of Brent Davis. He works with Steve's dad and wanted you to know he's got you in his thoughts and he's wishing the best. Hi James, This donation was made on behalf of Sue Sidener who is a very good friend of mine. You have been and continue to be in everyone's thoughts. Looking forward to seeing you. Hey James! Keep up that hard work! I have been where you're at. In 2006 I broke my C7 and went through rehab and the whole deal. I still use a chair and have had some experience, so if you ever just want to talk to someone who has been where you're at and has lived with a spinal cord injury for years, definitely get a hold of me! That goes for your folks, too! Any questions, any tips you want to know (even about how the hell you put on socks), just ask! You'll be in my thoughts! My heart really goes out to ya, brother. Here's my info: [email protected] 618-979-1088.
james You probably don't remember me. I worked with your dad at crucible. I remember picking him up in Florida and all you boys were having fun on the beach. Keep positive and work hard to learn from these lessons God puts our way. He obviously knows you are strong and is testing your will. You have great inner strength I am sure. Plan on making a trip to the UK.... I will show you the sites! Be strong yet flexible and focus on your goal. Thinking if you my friend and hope to see you soon! Keep posting those photos! James, we've always admired your strength of character. Our love and prayers are with you as you meet all the challenges and celebrate the accomplishments ahead. Hope to visit with you soon. Our thoughts and prayers are with you and your family. May each and everyday be bright with the light of hope for you. God is with you. Andy and Rosie Mogged, your cheesehead Wisconsin cousins. Love and Prayers go out to James. Keep the faith. You will make it! You're a champ James! Love ya. Thoughts and prayers are being sent your way from your cousins in Wisconsin. Always remember, God is good and he has a plan for all of us.